When you first start out as an author, the production phase of a book (editing, formatting, packaging, uploading, scheduling, promotion and more) tends to be overlooked. You don’t think about devoting time to the production side. It’s just something that happens after you’ve written the book. However, if prolificacy is something you’d like to pursue, then you should seriously consider scheduling production time for a book…and it shouldn’t be the same time as writing time. Here’s an example: If you currently have your writing time scheduled for every lunch break, and two hours every weekday evening, it’s very common to use all that time for writing and when you’ve finished the manuscript, use all that time for production. It’s what comes next, right? However, there are a lot of experts and a lot of writers out there that insist that taking big chunks of time away from writing first draft manuscript kills the creative mind-set. When you get back to writing once more (which is often weeks later), you have to pick up the reins and get back into the practice of producing wordage. You lose momentum. You should always be writing something. The best way to do this is to split your spare time, and always be producing the next book, too. So instead of writing every lunch break and for two hours in the evenings, write during your lunch and use every second evening’s allotted time for production. Or split the two hours in the evening for production and writing. Knowing how fast you write a book (see Prolificacy, from the past two month’s posts) helps you decide how much of your spare time can be given over to production. I like to split it as evenly as possible. You can manage your release dates. I’ll be covering the advantages of managed release dates and production schedules in a later post. If you’re spending some of your time writing, and some of your time producing books, then it would be to your advantage to reduce the amount of time you need to produce a book, so you can spend more time writing. The best way to do this is to build and maintain checklists. There are myriad details you have to remember whenever you put a book into production. Every book distributor has a different set of criteria for the formatting and uploading of books to their platform. Then there are all the activities surrounding a launch, including updating your website, and updating the previous books in the series. There is also backlist maintenance that should be considered a part of your production process, for the review and maintenance of older titles most often involves editing, reformatting and re-uploading, even if you’re not revising the complete package. Every step of the process has intricate details that have to be remembered and taken care of, down to the simplest items like, for example, removing the table of contents from your book and saving the file to Word 95-2003 format before uploading to Smashwords, or the painstaking process of finding good keywords and categories. If you have a list of items to complete and check off, then you won’t find yourself staring into mid-air (and wasting time), trying to figure out if you’ve overlooked anything. Your checklist(s) can itemize the production process step by step, provide links to booksellers and sites that help with the editing process, as well as contact information for experts and contractors you’ll need to reach out to at various stages. You can keep your checklists in a simple word processor document, and copy the master over to your book’s folder each time you start a new book. Or you can use a task manager like Outlook or ToDoist, and take advantage of reminders and deadlines, and the psychologically rewarding activity of checking off finished tasks. As you produce book after book, your production process will change and improve. The checklist(s) can be adjusted to reflect those efficiencies, helping you whizz through the process and get back to writing, instead. 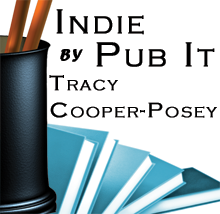 Columnist: Tracy Cooper-Posey writes vampire romance series and hot romantic suspense. She has been nominated for five CAPAs including Favourite Author, and won the Emma Darcy Award. She published 35 titles via legacy publishers before switching to indie publishing in March 2011. She has published over 45 indie titles to date, including her latest fantasy romance, The Branded Rose Prophecy. Her indie books have made her an Amazon #1 Best Selling Author and have been nominated four times for Book of the Year. Byzantine Heartbreak won the title in 2012. Tracy has been a national magazine editor and for a decade she taught romance writing at MacEwan University. An Australian, she lives in Edmonton, Canada with her husband, a former professional wrestler, where she moved in 1996 after meeting him on-line. Her website can be found at http://TracyCooperPosey.com.